Enjoy Feng Shui fountains for the home and garden. A feng shui fountain helps to balance energy and increase personal strength. Here are other ways these wonderful fountains can add a piece of mind. You can incorporate feng shui fountains indoors or out. There are many different styles including tabletop, floor-standing, wall-mounted and outdoor fountains. Water fountains bring the energy of water, one of the ancient feng shui symbols. When selecting your fountain look for a quality fountain with a nice smooth design that is easy to clean and care for. Many people choose ceramic or glass for the materials but really, any material is ok as long as the water sounds and feeling of water is incorporated. You can utilize a fountain for feng shui in any room, your own personal sanctuary, your office, bedroom or living room. Tip #1: How do you Use Fountains in Feng Shui? I want to add to my feng shui, how do I do so with a water fountain? Water fountains are among one of the most common feng shui items in a home. One of the main reason is that they can promote health and well being by infusing negative ions into the air, providing humidity and of course, beauty. Fountains also bring the element of water to your environments and water is the ancient chinese symbol of prosperity and abundance. Fountains can be used indoors or out to incorporate feng shui. They are very commonly used indoors as many indoor environments are starving for their negative ions and humidity they give off. When selecting a fountain for feng shui be sure to choose a high quality fountain with soothing water sounds and one with a quiet pump so you don't have the annoying sound of a fountain pump to distract. 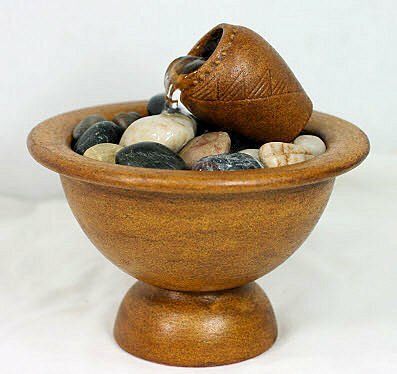 Feng Shui fountains can be constructed of a variety of materials but ceramic is a common one. Also, many of the ceramic fountains are hand crafted making them of utmost quality. Tip #2: How do you Incorporate Feng Shui in your Home Decor? How can I feng shui my home? Feng shui is all about creating balance and harmony in your life. Creating a place that is comfortable and loving for you and your family. When I think of feng shui, I think of clean, crisp, strong decor. Bringing nature indoors with a water fountain is a great way to incorporate harmony in your indoor living spaces. A couple things before you are search for your fountain and other feng shui decorating ideas...Clear the clutter! Cleaning the clutter gets rid of the bad, messy energy making room for the new. The second must have is good light and good air quality in your room. If you don't have this you won't be able to create good Chi. A water fountain can work here as well as water humidifies the air, thus, increasing the air quality. A couple ideas of good feng shui products for your home are tabletop fountains, wall art or a buddha art piece. You can combine the buddha and fountain in one with this buddha water fountain. Most importantly, have fun with it! If you have a good color map of your colors in each room, good air and no clutter you are ready to begin choosing your feng shui decorating products. Where can I buy a feng shui water fountain? Feng shui fountains come in a variety of sizes, styles, and colors. A true feng shui water fountain should be made of materials that will maximize the sweet soothing sound of rainwater. One made of hard plastic wouldn’t have the same effect as one made from copper, ceramic, or slate. Form and beauty play an important role when choosing a feng shui tranquility fountain, but it’s the soft rush of water that makes all the difference in the world. One of the best places to find feng shui fountains is right here at SerenityHealth.com. You’ll find a huge array of tabletop fountains, free-standing floor water fountains, and framed waterfalls that can serve as an alternative to a traditional fireplace. Feng shui fountains aren’t necessarily expensive, but they should be considered an investment. Top quality feng shui fountains became part of the home’s architecture. Consider them works of art that are chosen as carefully as any exotic painting or sculpture. When your budget is leaning towards a smaller tabletop feng shui fountain, or a large wall sized waterfall, make sure it’s a feng shui fountain that’s aesthetically pleasing to your senses. When you shop at SerenityHealth.com, take some time to really look at the feng shui fountains, consider the size and where you might place it in your home. The site even incorporates live sound so that you can close your eyes and listen to feng shui fountains before purchasing. Will I ruin the feng shui balance if I focus too much on making sure the feng shui fountains match my decor? Feng shui water fountains are more than just everyday fountains. They bring peace to the home and to the spirit. One place that people sometimes overlook when creating harmonious spaces in the home is the bathroom. Using the master bath as a place to incorporate the principles of feng shui is a great idea and it’s easy to do. The first thing you’ll need are some water fountains. You may want to purchase small one to complement small bathroom spaces, or invest in a higher-priced wall-mounted fountain for that focal point on the wall. Feng shui is for everyone, so don’t worry about spending more than your budget can handle. The important thing is to choose one that will blend into your décor. Ceramic table fountains make excellent choices for the master bath area, especially if your fixtures are made of ceramic, if you have ceramic tile, etc. Then again, you might want to juxtapose warm and cool (ceramic and slate) to create a balancing effect. Of course you want to incorporate styles that suit your interior design, but it’s important to remember that feng shui isn’t about that. Ultimately, it should be about balancing the energy in your room so that it comes back to you in the form of positive chi. How can I create my own personal sanctuary at home? Feng shui is an old Chinese practice that uses the laws of both Heaven and Earth to better life by receiving positive chi. When using fountains to create chi in your home, think form, function, and beauty and create balance the energy in your home. While it’s not necessary to incorporate the laws of feng shui through the entire home, dedicating the most commonly used room in the home to feng shui fountains will serve as a focal point for entertaining and relaxation Everybody needs a safe place to come home to, a place where you can relax and be yourself. By incorporating feng shui fountains into your living space, you’ll be sending a message to yourself that it’s okay to relax. The workday has come to an end. It’s okay to let go of any tensions that have accumulated during the day. okay to be yourself in your very own sanctuary. How can I create a feng shui space if I can't find a room in my home to use? When people think of feng shui, they often think of indoor spaces in need of holistic balance. However, the principles of feng shui can be applied pretty much anywhere. If you’re new to the concept just remember that it’s a means of strategically placing objects in your living space to achieve inner harmony, peace, and prosperity to your life. There’s a lot that goes on in your home. Maybe you have teenagers who frequently entertain friends, play loud video games, or watch live sports on the flat screen television. Just as you need your space, they also need theirs. Don’t try to take spaces away from people; instead, create a space that’s all your own. Sometimes the best room in the house isn’t in the house at all. If you live in a climate where you’ll be able to enjoy the outdoors more often than not, why not create a space for yourself in the garden? You’ll need wind chimes, plants that attract butterflies and hummingbirds, and (most importantly) a fountain. Create a pathway to your outdoor room with a few strategically placed zen garden fountains. Welcoming yourself to your outdoor space with feng shui fountains is a sacred act that will help you shed your everyday worries. How can I turn my massage therapy practice into something more inviting for my clients? One of the best and most appropriate places to apply the principles of feng shui is in a massage clinic or spa. In order for your clients to achieve the full benefits of massage therapy, they should be surrounded with items that sooth the senses. Aromatherapy oils, incense, soft music, dim lights, and feng shui fountains can turn an ordinary office into a respite for relaxation. When you’re ready to start shopping for feng shui fountains, buy a combination of table top and floor models that can be placed in areas of best visibility. You want your clients to get the most benefit from the fountains by placing one within the peripheral vision of the client lying on her back, and another at her feet for when she’s lying on her stomach. 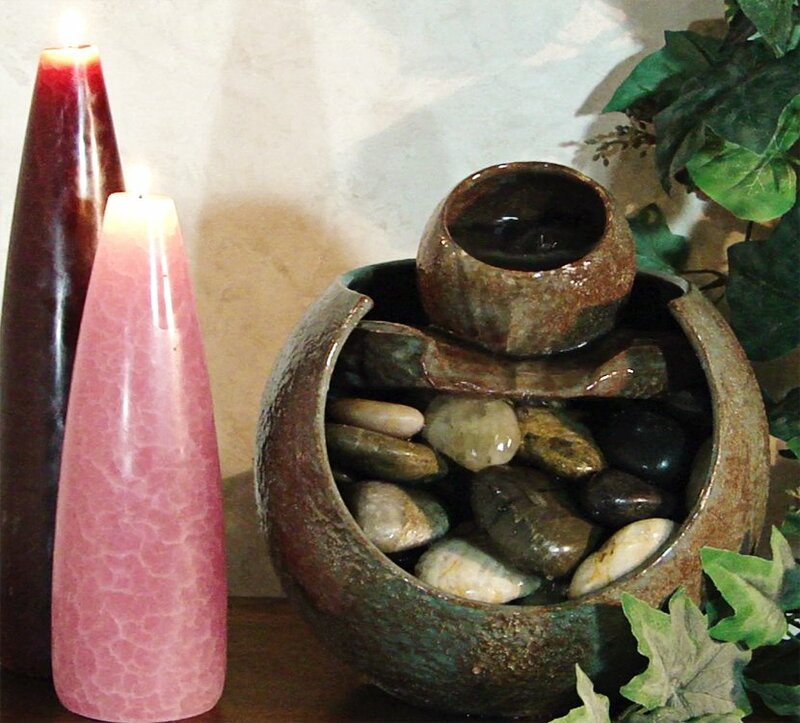 Feng shui fountains will bring that final touch to your massage clinic. They show that you care about the client and that you want your client to get the most from his or her visit. Whether you can afford an expensive model or a discount fountain doesn’t matter. What matters is the care and energy you put into choosing a suitable style for your space. Feng shui fountains are easy to use and practically maintenance free, leaving you more quality time with your clients. Is it hard to maintain zen garden fountains? Nothing says “feng shui” like a feng shui tranquility fountain. In order to attract nature’s best, purchase good quality zen garden fountain. Garden fountains should create a haven for birds, pets, friends and family. As long as you’re not treating the fountain water with any chemicals, it’s perfectly okay to allow your pets to drink the refreshing water. Don’t be surprised if birds settle into the fountain for a refreshing bath, either! Whether you have a large, sprawling, formal English garden or a small and wild cottage garden, you can easily create a place of harmony. The whole idea behind a feng shui water fountain is to balance the forces of nature and create a healthy energy for all living creatures. By being open to sharing your feng shui fountains with all living beings big and small, you’re opening your heart space to positive energy, or chi. Keep in mind that zen garden fountains do require a little more maintenance than the typical relaxing indoor fountains. When you’re exposing zen garden fountains to the elements -- and the birds -- it’s important to keep them clean. Generally, all this entails is a wipe-down and a change of water every now and then. Keeping a beautiful feng shui water fountain for all creatures to enjoy is simple! What kind of feng shui fountains should I use for a corporate space? 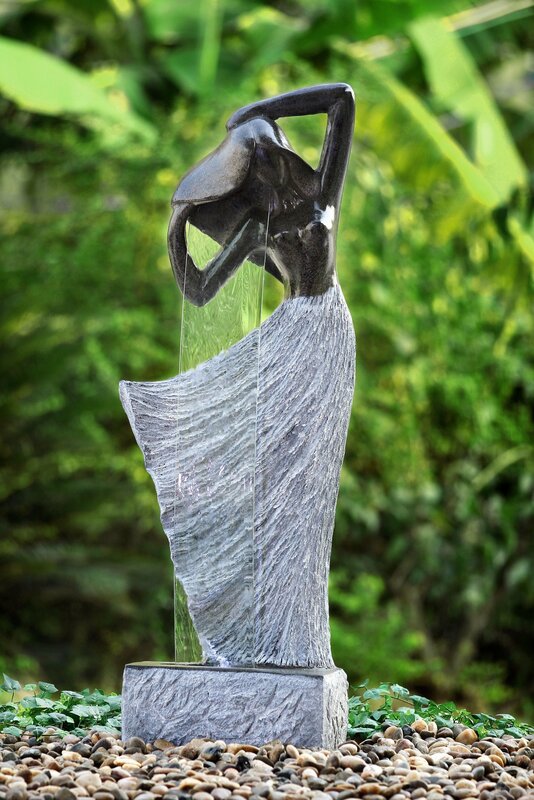 A fountain used for feng shui should bring harmony to a room by creating soft white noise. White noise is the neutralizing factor inherent in busy work spaces, restaurants, banks, etc. Have you ever been in a busy restaurant full of chattering people only to realize that your own conversation seems to be quite private? You look around and hear a din of noise, but nothing specific can be heard. Somehow, the restaurant has created an atmosphere with positive white noise. It could be the sound-absorbing plants that envelope the room, or the carefully placed feng shui fountains. If you’re a corporate executive looking for a way to lower the decibels and stress level of your busy spaces, consider investing in a fountain. The beauty of feng shui fountains for the corporate space is that you can customize them to match your building’s architecture and style. You can even incorporate your company’s logo into the overall design of the feature. Deciding to improve your corporate space with feng shui water fountains is the first time, settling on a design is the next. Visit other corporate spaces, search the Internet, or hire someone to help you design the perfect style for you. Tabletop feng shui water fountains are standard and cannot be customized in any way. However, when you’re talking about corporate spaces, you’re talking about making a big difference in lobbies, waiting areas, restrooms, and meeting rooms. 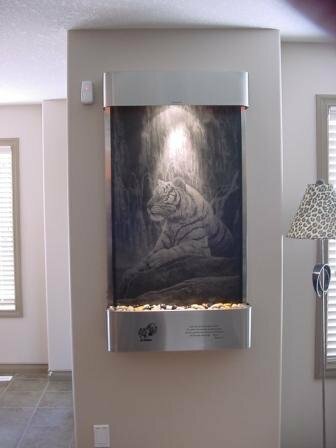 That kind of change requires a customized look that you can only get with standing floor or commercial wall hanging fountains.